One of the fruits of the Lutheran Reformation of the 16th century was the emergence of the hymn in the vernacular, to be sung by the congregation or by the faithful at home. Luther himself was the first who wrote such hymns, sometimes only the text which was then set to music by a composer of his time, sometimes also a melody. Others followed in his footsteps and this has resulted in a large number of hymns which found their way into hymnbooks, first in Germany, later across Europe. Hymns were incorporated in motets, sacred concertos and cantatas and were a major source of inspiration for composers of organ music. Chorale preludes and arrangements and sets of variations on hymns by composers such as Pachelbel, Buxtehude and Bach are part of the standard repertoire of organists. 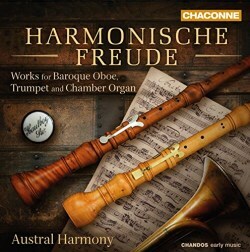 The present disc includes music for organ with an obbligato part for a wind instrument. This was a genre which was especially popular in the third quarter of the 18th century. That was the time most composers represented in the programme were active as organists in various churches. They were all connected in one way or another to Johann Sebastian Bach. Johann Ludwig Krebs was one of his most prominent pupils whose style is close to that of his teacher, to such an extent that some pieces are attributed either to him or to Bach. Another important pupil was Gottfried August Homilius who worked most of his life in Dresden and whose output has started to be explored since the beginning of this century. The oldest composer in the programme is Georg Kauffmann. He was one of the applicants for the job of Thomaskantor in Leipzig after the death of Johann Kuhnau in 1722. At the time he was organist at the court of Saxe-Merseburg and was later promoted to court Kapellmeister. The pieces played here come from a collection of 98 chorale preludes and 66 basso continuo settings of chorales which was published on subscription basis. That was quite unusual for organ music which was seldom published. Also new was that the collection included six pieces in which the chorale melody could be played on the oboe. These are the earliest compositions of this kind in Germany. The latest composer on this disc is Christian Gotthilf Tag. He was a pupil of Homilius in Dresden and worked from 1755 until his death as Kantor and schoolteacher in Hihenstein-Ernstthal. He was held in high regard as Kantor and organist. The chorale prelude Nun danket alle Gott is scored for organ and horn or oboe. The obbligato parts in such organ works were mostly intended for a wind instrument: transverse flute, oboe, horn or trumpet. With the exclusion of the flute these were instruments not played by amateurs but rather by professional players. It is therefore unlikely that this kind of organ preludes were written for domestic performance. This seems to be confirmed by the organist and scholar Jakob Adlung who in his Anleitung zu der musikalischen Gelahrtheit (1758) stated: "Although one is mostly in the habit of giving performances on the organ alone, it is also pleasant if an oboe or other suitable instrument is secretly placed behind or near the organ to perform the chorale with organ accompaniment, either with the music or extemporaneously." This clearly refers to the use of a larger organ, with the obbligato instrument acting as a kind of organ stop. This is exactly the main reason that I am not really satisfied with this disc. Peter Hagen plays a small organ which results in the oboe and especially the trumpet being too dominant. They play a solo role here instead of adding an extra voice to the organ parts. In a number of pieces the trumpet plays the chorale melody and the oboe takes the upper part of the organ, because the organist needs his two hands to play the remaining two parts. The liner-notes are not very clear about the original scoring of some pieces but at least some of them include a part for pedal which needs to be played here by the left hand of the organist. The balance between the various parts - organ and obbligato instrument - would have been much more natural if a large organ with a pedalboard had been used. The lack of balance also damages the Trio sonata in d minor (BWV 527) by Bach. It is conceived for organ but is often played in other scorings, such as recorder and organ or as an instrumental trio sonata, with two treble instruments and basso continuo. That is perfectly legitimate as long as the three parts are treated on equal footing. Here the right hand of the organ is taken by the oboe and as a result is too dominant. In particular the bass is seriously underexposed, as it is played on the manual of the chamber organ. There is nothing wrong with the playing of the three artists, although I would have liked more dynamic shading in Jane Downer's performances, for instance in Bach's trio sonata but also in Homilius' Sonata in F. Simon Desbruslais plays a natural trumpet but turns to the modern trumpet in the last two items by Kauffmann. The reason escapes me and it is only mentioned in the booklet; no reason is given. This is a nice disc which allows the listener to become acquainted with a genre which is not that well-known. However, the performances are less than ideal, especially in regard to the balance between the participating instruments.